Pasadena Police Detectives and Federal Bureau of Investigation (FBI) Agents hope a video recording of the man who is suspected of having committed the Cheesecake Factory explosion, and a reward of up to $20,000, will prompt witnesses to come forward with the suspect’s identification. On Thursday, February 2, 2017 at about 6:08 P.M., Pasadena Police Officers and Fire Department personnel responded to a call of an explosion at a Cheesecake Factory restaurant at 2 West Colorado Blvd. Police Officers immediately entered the restaurant and evacuated customers and employees and located a detonated homemade pyrotechnic device. The Los Angeles County Sheriff’s Department Bomb Squad responded to the scene and rendered the location safe. No customers or employees were seriously injured during the incident. Witnesses described the suspect as a male, possible of Hispanic or Middle Eastern descent, 6’0” tall, thin build, with a heavy beard and wearing all black clothing and a black beanie. Since the incident, Pasadena Police Detectives, in collaboration with FBI agents, have been actively pursuing investigative leads. FBI agents conducted an extensive canvassing of businesses on Colorado Boulevard. for security videos. This effort resulted in the recovery of a video recording which shows the suspect entering a Pasadena business after the explosion occurred. The video and photos being shown at the press conference depict the suspect wearing a white shirt but carrying black or dark clothing, which he discards in a trash can at the business. A reward of up to $20,000 is being offered in exchange for information leading to the arrest of the person or group responsible for attack. Law enforcement will treat information provided with confidentiality. A tip line has been established to receive calls 24 hours, 7 days a week. The tip line number is 1-800-CALL FBI (1-800-225-5324). Pasadena Police and the FBI are asking for the public’s assistance in identifying the suspect, but remind the public to not take action to detain or contact the suspect. This person should be considered dangerous. If seen, please contact local law enforcement promptly. Persons may also contact the Pasadena Police Department 24/7 at (626) 744-4241. 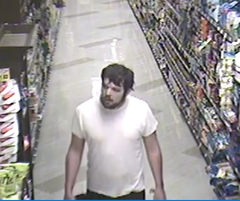 Attached is a still photo of the suspect, along with a YouTube link of the security video.